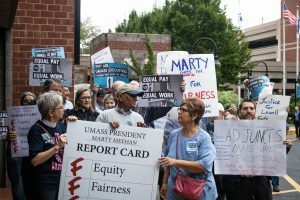 Adjunct faculty members, UMass Lowell campus community and allies protested outside the UMass Board of Trustee meeting as UMass president, Marty Meehan, faces mounting pressure to end the inequitable and unfair treatment of UMass Lowell students and faculty. Lowell, MA – Today, UMass Lowell adjunct faculty members, students, staff and allies gathered outside the UMass Board of Trustee meeting held at the UMass Lowell Inn and Convention Center to protest the inequitable and unfair treatment of UML students and faculty by UMass president Marty Meehan and the UML administration. UMass Lowell’s adjunct faculty members, representing nearly half of the University’s teaching staff, have been working without a contract for over three years. This summer, the group launched a hard-hitting ad campaign calling out embattled UMass president Marty Meehan for his unethical and inequitable treatment of a key part of the UMass Lowell workforce. Adjunct professors at other UMass campuses are eligible for healthcare and retirement benefits. At Lowell, the administration rigged the system to prevent educators from accruing course credits, and even those who surpass the credit threshold are still denied benefits. 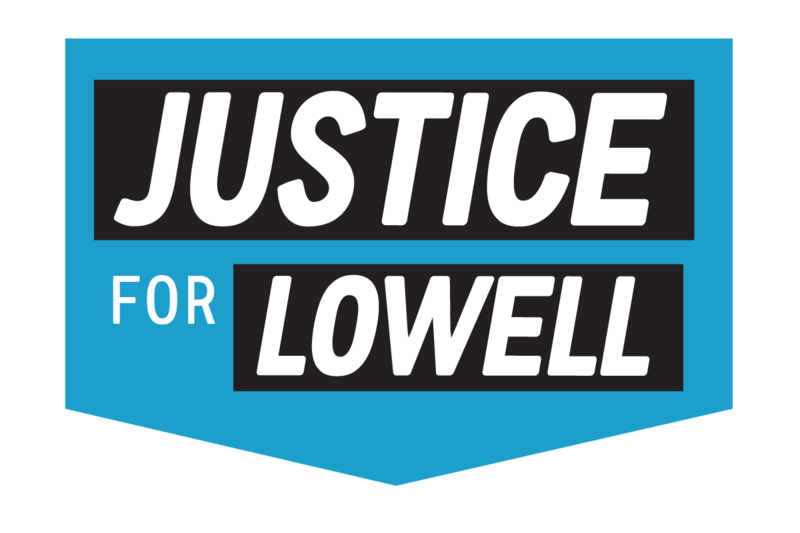 The official health insurance proposal offered to Lowell adjunct faculty would cover fewer than 40 out of 500 professors. “We’ve tried to get their attention before, but apparently they were too busy negotiating million dollar contracts for Marty Meehan and voting to raise student tuition and fees to take much notice of the people who are in the classroom actually doing the core work of our university – teaching,” said Ellen Martins who has been an adjunct faculty member in the Music Department at UMass Lowell for 35 years. The difference in pay for adjunct faculty is significant between Lowell and Amherst campuses – as high as 40% in many cases. Under the current offer, a significant equity gap close to that same percentage would still persist. Protesters tried to deliver a large report card to Marty Meehan giving him failing grades for Equity, Fairness, Health Care, Respect, and Justice. Other protesters held a banner calling on Meehan to do his job. Adjunct faculty scored a victory yesterday in their efforts to combat an intentional scheme to deny adjunct professors the ability to earn enough course credits to qualify for benefits. Under mounting public pressure, thanks to new campaign efforts by the union and the filing of a state labor charge of prohibited practice, the university recently agreed to remediate any instances in which professors had been wrongfully denied opportunities to teach additional classes due to the scheme. The university also committed to sending a letter to deans and department chairs advising them that the prior guidance to deny adjunct professors benefits by artificially capping course loads would no longer be the university’s policy. The scheme came to light thanks to emails that were uncovered in which department officials revealed they’d been instructed to maintain the artificial course cap.